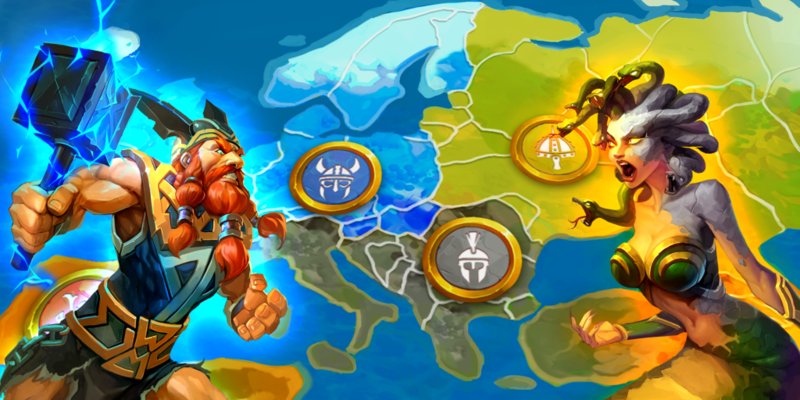 When we revealed details about World of Myths we announced that the Loyalty and the Faction Wars will be a big part of the game. So we thought – why do we wait for the launch? Why don’t we start the competition right away? And so we are happy to announce the Prelaunch Faction Challenges. The Prelaunch Faction Challenges will take place on our Discord server. So if you have not joined it yet – now is a perfect time to do so. By actively participating in the challenge you will earn points for yourself and for your Faction. At the end of the 4th week, the players with the most points will be granted access to the game even before the early access. (Kind of super-duper early access). 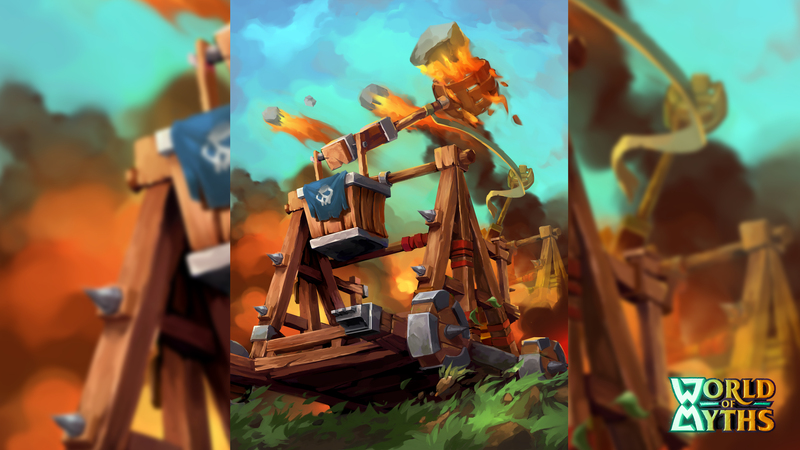 On the launch date, the players from the Faction with most points will be granted multiple bonuses like increased gold gain (in-game currency for purchasing card packs); increased reputation gain; some card packs etc. The second in place Faction will receive fewer rewards and the third will get just a “participation price”. Of course, the players with the most points will get additional perks that will be announced later. One of the mandatory actions you need to take in order to participate in the challenges is choosing a Faction/Mythology that you feel you belong to. 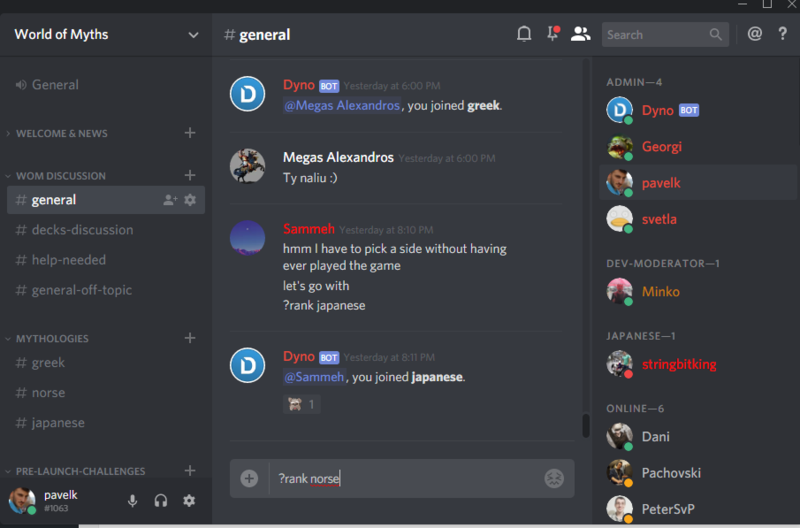 Once you are on our Discord server you can easily do that by typing “?rank japanese/norse/greek”. Those 3 will be the mythologies available at the launch of World of Myths. You can switch mythology at any time but the points you have earned for your previous Faction will not be transferred to your new one. You can also use the “?ranks” command to check out info about the Factions. As some of you probably know we are quite a small team and this is one of the main reasons why we still have not released World of Myths. We could use some manpower. Since the start of the project, one of our main pillars was to involve the community as much as possible and so far this proves to be working great – the game has improved dramatically. We want to take that one step further. Most of the challenges will be mini-tasks that our small team never finds time to do – spell checking and wording, visual bugs, social interactions etc. As everything else, we want to involve you as much as possible so if in the course of the Prelaunch Faction Challenges you came up with an idea for the next challenge – feel free to suggest it – you may get some extra points ;). There will be some big tasks that need to be done that require more time and efforts. They will be announced separately from the weekly challenges and will grant a huge amount of points because they will not be so easy to do. We are super excited about the opportunity ahead of us with the Prelaunch Faction Challenges. As we are not some large corporation most of the rules and rewards can change based on your feedback and thus will be dynamic but will follow the common sense. We hope to have some amazing experience during the prelaunch period together. 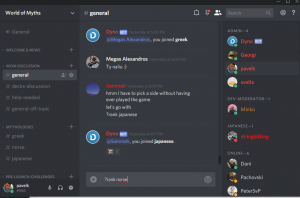 See you all on our Discord server where we can further discuss the challenges.